Also known as a Yorktese and Malki , these little dogs seem to have the best of two awesome breeds, the Yorkshire Terrier and the Maltese. Their appearance might surprise you as some Morkies end up resembling one of the parent breeds more than a blending of appearances. Most of these little guys tend to resemble the Yorkie, but they can also look very much like the Maltese with lots of white hair. The Yorkshire Terrier is best known for its spunky, outgoing personality with a big heart and fearless temperament; they will gladly warm your heart and your lap. They make great watch dogs and can be feisty at times. They do not shed, but need regular brushing. These dogs fit well in any home that is looking for a pet with lots of spirit and loyalty. The Maltese is best known as a breed with a gentle, loyal, affectionate personality. These dogs too are non-shedding so fit well with a family suffering from allergies. They are playful, bubbly, and totally devoted to their owner. What do you have when you put them together—A Morkie or a Yorktese—a super sweet combination. Morkies are always one-half Yorkshire terrier and one-half Maltese and can take on characteristics of one or both parents. It can be difficult to determine the size of a Morkie due to the fact that the offspring can take on characteristics from each breed involved. Generally, Morkies range in height between 6-15 inches and weigh between 5-10 pounds, depending on the size of their parents. Most are small averaging around 7 to 8 pounds as adults. Morkies love people and are very friendly, social and loving. They also do well with other dogs. They are extremely loyal to their owners and often become attached to one person. Like the Maltese, a Morkie may become bored when left alone too long and display behaviors such as chewing and barking because they long for human companionship. Separation anxiety can be a problem. They can be very rambunctious and playful and generally get all the exercise they need indoors. Normally, the coat of the Morkie is silky, straight and fine. Usually the hair is long if left uncut and comes in a variety of colors such as black, tan, white, a combination of each. If the parent Yorkie has colors other than the traditional blue and tan or blue and gold, the resulting Morkie can see these more unusual colors including chocolate. They do need regular brushing to keep the coat looking its best because the hair can get tangled. They can also be prone to tear staining if their face is white. On the bright side, they are non-shedding and somewhat hypoallergenic. They are a great choice for apartment and city dwellers and can live well with a family with children. Since most Morkies are small, it’s best if the children are older. As with all small dogs, it is important to teach children how to interact with and handle their puppy gently. Hybrids or Designer Dogs are the combination of genes from both the mother and father, just as purebred dogs. So, how do you know what you are getting? 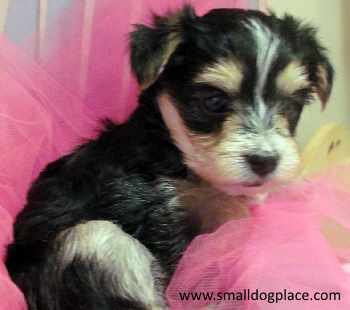 A good rule of thumb is to get to know the parents of the Morkie puppy you are considering. What are their personalities and temperaments like? What are their specific characteristics? Do they have any medical problems that you should know about? The best way to find the answers to these questions is to ask the breeder and visit him/her at her home. If this is not possible and you must meet her half way between your home and hers, ask that she bring the parents with her if at all possible. If the puppy is to be shipped, it is a good rule of thumb to ask the breeder to describe the parents. All dogs are unique and their temperaments can be identical to their AKC standard but most are a combination of genetics and environment. It is often impossible to tell which characteristics are inborn, genetic or inherited through the parents’ genes, and those characteristics that have developed as a result of socialization and the ongoing environment. Brain research tells us that both factor into the equation. Do you own both parents? If not, have you met the other parent (sire/dame)? What kind of personality did he/she have? If they own both parents, How long have you had the parents? What was the situation/environment like that they were raised as a puppy? What do you do to socialize the puppies? What types of personalities do the parents have? Would you be comfortable owning a puppy with these characteristics? Hybrid or Designer dogs are becoming more and more popular and most have the personalities and temperaments that people want. Many people claim that they are healthier than purebred dogs because they have a fresh set of genes. The majority of people are very happy and pleased with the puppy they purchased from a reputable breeder. Exceptions do occur, so the best rule of thumb is buyer beware. Since these dogs are hybrids, they cannot be registered with clubs such as the American Kennel Club (AKC), but for those that want a registered dog, there are several agencies that register hybrids.